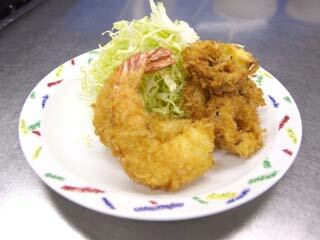 Shrimp fry and Squid fry are popular Japanese daily dishes. They are also popular for Bento, Japanese launch box. It is very easy to cook and taste good. Squid fry is also called Ika-Ring, because of the ring shape. This is for deep fry batter. Flours, Eggs, and Bread crumbs. First, peel Shrimp and remove the organ. Cut the tips of the tails. For deep fry batter, mix eggs. Remove the white pieces of eggs. The temperature of the oil for fry is about 180 degree C.
To check out the temperature, add little eggs, and dip into the oil. If you have many small bubbles, the oil is ready. This is called "Aburakiri" for dropping extra oil. Next, Squid. The same process. Fours, eggs and bread crumbs. Decorate them on the dish with fine sliced cabbage.